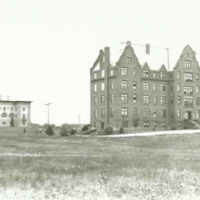 The third major structure to be erected on campus, Albert Hall was built as a residence for the university's first lay students. Designed to accommodate a hundred residents, it housed twenty-seven occupants when it opened in February 1897. 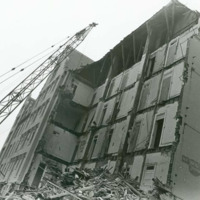 Its opening was delayed by a hurricane that caused extensive damage as the building neared completion. Originally called Keane Hall after the first rector of the University, Bishop John Joseph Keane (1839-1918), the Hall was later re-named in honor of the donor, Captain Albert F. Ryan of Norfolk, Virginia. Unlike its Norman-style predecessors Caldwell (1888) and McMahon (1895) Halls, Albert Hall was a tall narrow red brick structure with Flemish gables. A description of the building printed by acting-rector P.J. Garrigan in 1897 describes it as containing forty-two two-room suites, bathrooms with both tubs and showers and toilet rooms on each floor, a chapel, dining hall, kitchen, recreation room, parlor, and storage areas for trunks and bicycles. Students and faculty rented rooms for ten to seventeen dollars a month, depending on the location and size of the room. A notice about the residence in the November 1938 Tower noted that all of its rooms were well ventilated and situated to receive sun at some time during the day. I. All boisterous conduct is at all times prohibited in the Dormitory. II. The loud playing of musical instruments, loud conversation and singing, and anything that might distract or disturb those inclined to study are prohibited on class days except between the hours of 12-2 and 6-8 p.m. This rule does not apply to the pool room. III. No ladies, except immediate relatives, are allowed to visit the rooms of the students. IV. All forms of gambling are forbidden in the Dormitory. V. The introduction of intoxicating liquors into the Dormitory is forbidden. Electricity for the entire campus was powered by a dynamo that was shut down at ten p.m. After lights out students who needed to study could put money in a meter to power gas lights in the study rooms. 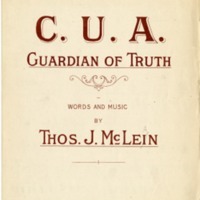 In 1904 financial difficulties prompted the University to begin admitting undergraduate students. Housed at Albert Hall, they soon brought their own interests and changes to campus life. 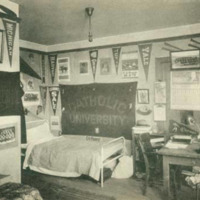 Frank Kuntz, the first undergraduate student enrolled, writes in Undergraduate days: The Catholic University of America, 1904-1908 (1958) that Albert Hall was the setting for the organization of the first student governing body and campus athletics. The baseball team, consisting of anyone who wanted to play, was given permission to use vacant land north of Caldwell Hall and west of the Observatory. Also during Kuntz's time nearby Brookland grew from a sleepy village to a developed suburb of Washington. 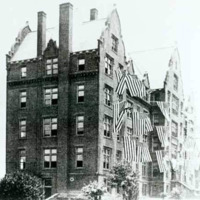 As the University's enrollment increased, arrangements were made with the new owners of row houses, many of them civil servants low on cash, to rent rooms to graduate students. 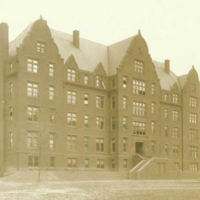 During World War I the University offered its services for the war effort and during that time Albert Hall, along with Gibbon Hall, housed a training school operated by the paymaster general of the United States Navy in which some 600 paymasters were commissioned. The University's first infirmary, organized at the request of the undergraduate students, opened in Albert Hall in 1929-1930. In 1940 Albert and St. John's Halls housed American priests who were prevented by the war from pursuing graduate education in Rome. So aged, wilt thou never die? Are names of men - thy sons of yore. And woe unto the room we'd wreck. And staidness comes to mock the dead.